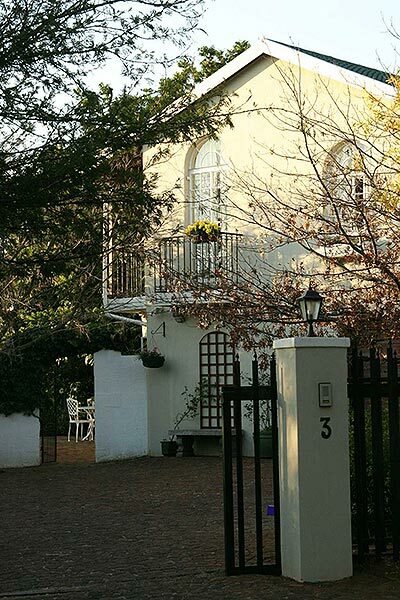 Darrenwood Guesthouse is located in a quiet,leafy suburb and offers excellent accommodation,surrounded by a beautiful garden with prolific birdlife.There is a sparkling pool for the convenience of guests. We are centrally located, minutes from Cresta Shopping Centre and Randburg. Sandton and Johannesburg surroundings, "Brightwater Common",the Dome and Monte casino are within easy reach. We offer secure parking,laundry service,internet facilities in rooms. Airport transfers can be arranged. Children by arrangement only. Languages spoken: German, Dutch, French. Creditcards welcome. All rooms have private entrances, fans, writing desks, DSTV, fridge, coffee and tea tray. Self-contained with kitchenette Shower. Small extra bed. Terrace overlooking swimmingpool. A two bedroomed family unit, Sharing a bathroom, bath and shower. Upstairs terrace. Furnished with antiques, brass bed. Lovely view, terrace.